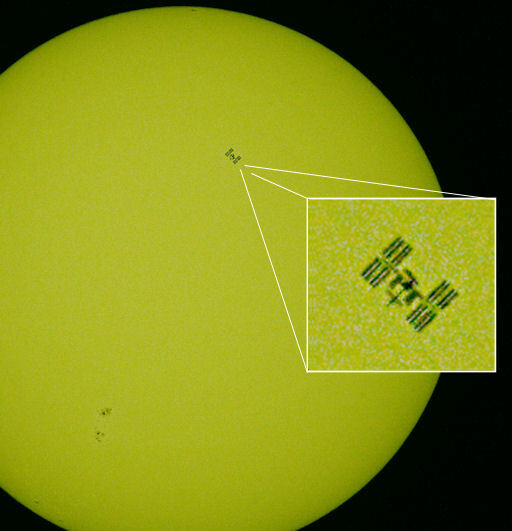 The International Space Station passed directly in front of the sun over Entre Rios, Argentina, where Leonardo Julio photographed the split-second flyby. "I traveled 250 km to be in the path of the transit," he says. "It occurred just as predicted by CalSky." The sunspot near the bottom of Julio's picture is AR1618. Although the sunspot is in decay, its magnetic field still harbors energy for strong eruptions. NOAA forecasters estimate a 30% chance of M-class flares and a 5% chance of X-flares during the next 24 hours. LATEST NEWS; The NOAA have now downgraded the geomagnetic storm expected on November 25th as the CME that was expected to hit earth is taking longer than expected to arrive. Hopefully the higher bands will be open for most of the day with some juicy DX to be worked on them in the CQWW CW contest. Taken from Charles M0OXO website. Team Antigua is saddened to announce that the V26B contest station was totally destroyed by fire on Sunday, November 18, 2012. Luckily, no one was seriously hurt. The station Owner, Roy V21N, received minor injuries due to smoke inhalation but is OK now. This station was used by John G4RCG and Bruce KI7VR back in 2006 (V26G). As of now, the future of the station is uncertain. It may be possible to rebuild it, as the antennas and towers were not damaged. However the interior and all equipment, tools and spare parts were totally destroyed. Click here for pictures of the fire. Information from FRC members Sam WT3Q and Dale N3BNA who just operated at the station on behalf of the club during the recent CQ WW SSB ,is that the station location, all the radio equipment and the various award plaques from previous contest wins are all destroyed . The antennas remained intact. Those involved with the station have vowed to rebuild. Well the guys on Lundy Island last weekend did a fabulous job and due to an unexpected deterioration with the weather, their stay was extended a little and which ultimately ended with them being airlifted by Helicopter back to the mainland (Photo above). The team consisting of John, M5JON, Peter, M0ILT, Ant, MW0JZE (pictured above center) used a Elecraft K3 with a KPA500 amp, a Kenwood TS590s with a Expert 1K amp (400W) and a IC706 as a backup radio/3rd station. The antennas were 2 x G3TXQ Hexbeams (supplied and built by Ant, MW0JZE, the main sponsor of the activation) and a 1/4 wave vertical for 40m. The guys logged 5100 Qso's in just over 4 days operating. Well done to all, great job and fb operation. (Qsl via MØURX OQRS). Felix Baumgartner, the man who tried to break the world's freefall record by jumping from 23 miles above the earth, breaking the sound barrier, has jumped from space. Felix Baumgartner, a 43-year-old former military parachutist, floated for two hours in a purpose-built capsule towed by an enormous helium balloon before leaping into the record books from 128,000ft – almost four times the height of a cruising passenger airline. Baumgartner reached an estimated speed of 1,342.8 km/h (Mach 1.24) jumping from the stratosphere, which when certified will make him the first man to break the speed of sound in freefall and set several other records* while delivering valuable data for future space exploration. The boys are now on the air from Lundy Island, EU-120, with a very strong signal in the UK. I have taken a couple of video's and they can be seen here at my You Tube channel. On one of the video's you can hear Charles (M0OXO) in the pile up. Don't forget guys the following IOTA activation takes place this week. Lundy Island (EU-120) - A small group will be activating Lundy Island (EU-120) from 11th to 16th October using the call MX0LDG. They will have 2 stations on the air from 06:00 to 00:00 each day - the islands power closes down at midnight each day - on SSB and possibly some DIGI modes. The equipment will consist of a Elekraft K3 and KPA500 amp, a Icom IC706 and Expert 1KW amp, and a back up radio. Antennas will be 2 G3XTQ Hexbeams built by MW0JZE (see http://www.g3txq-hexbeam.com) and a Vertical for 40M. A QSL card will be available through the teams manager Tim, M0URX, and all logs will be uploaded to LOTW and Clublog. Please use the OQRS on Tim's website (http://m0urx.com/oqrs/), DO NOT SEND CARDS FOR THIS ACTIVATION VIA THE BUREAU PLEASE USE OQRS. The team also support the DX Code of conduct (http://dx-code.org/) so please read and understand how to operate before calling. What a sight, this plane never ceases to amaze me. The people of Coventry turned out in their thousands at Coventry Airport to watch this awesome aircraft pay homage to the people and the companies that manufactured parts that went in to the building of these magnificent aircraft. Coventry played its part with the 2 factories of Dunlop (Now Meggitt) and Rolls Royce. The Dunlop factory in the Holbrookes area would have supplied some of the parts for the braking system, wheels and possibly the anti icing system fitted to most aircraft. The Rolls Royce factory with their engine manufacturing plant just outside Coventry supplying the engines in this bomber. Strangely when the aircraft flew through the engine noise was a lot quieter than I remember, and certainly a lot quieter than when it took off and landed at Doncaster a couple of weeks ago. But then all aircraft now are made to fly quieter for the anti noise pollution laws. As I said the crowds were in the thousands, with every vantage point along the airport perimeter road taken and the car park of a local retail area being full along with the laybys at the side of the A45 and A46 also being full. I also had a comment from a friend who was working and driving his articulated lorry on the A42 saying "I almost put my lorry up the grass banking when it flew over my head, the noise and the sight frit (a local word for frightened) me to death!" Obviously he had not been warned that the old girl was coming over!!!! I would like to thank the volunteers and the charity that keep this awesome aircraft flying. It is not owned by the Government, the RAF or a big corporation and is only able to fly and keep going on donations from shows and fund raising events. Full details are on the Vulcan to the Sky website, and just to show how much it costs to keep the plane in the air the fuel for the flight today cost £15,000.00 (GBP) or $24,250.00 (US) - so not a cheap thing to keep airborne and all donations welcomed. This Saturday afternoon 29th September, providing weather conditions and aircraft serviceability allow, XH558 will take off on a 3-hour sortie to commemorate Sixty Glorious Years of the Avro Vulcan as she makes a tour of various airports near to sites that played a significant part in their development or service life. We can only give approximate route timings from one point to another at this stage, as an exact take-off time will be subject to conditions on the day. Clearance from the relevant ATC units cannot be guaranteed until the aircraft is in the air talking to them, and will then be based on their own traffic movements at the time. Our experienced Navigator, Andy Marson, has spent today talking to all the units concerned to give them an initial briefing and to seek approvals. The proposed flight plan will take into account feedback obtained today, but we have to remain flexible, as the final flight plan may well have to change on the day. Although we hope to be able to tell you more on Friday, information on how the sortie is progressing will be made available on our official Twitter feed, providing actual route and expected timings. If you wish to see XH558 on Saturday, our advice at this stage is please plan to be near one of the listed locations from about 3pm watching our Twitter feed on your mobile. We would stress that to comply with the conditions under which we operate, this flight will consist purely of approaches and fly-pasts - no displays are planned. Approximate timings to be confirmed on Friday with actual route times via our official Twitter feed. 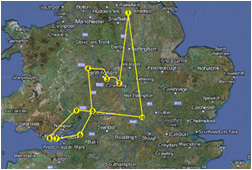 Route markers: (Refer to map which will be refined by Friday). 5B/G4MKP, 9M4SLL & CY9M Direct QSL cards are ready to be posted Friday 21st September. All direct QSL requests up until last Sunday are ready. 18 packets including GDXG, MDXF, DDXF and DX Italia. All QSL request from this week will be processed in the next few days. Thats it folks. The fantastic Summer of Sport has come to the end. We have been treated to a superb Olympic and Paralympic games in London. A excellent Euro 2012 football tournament, where we must congratulate Spain on winning their third consecutive competition. Some exciting motorsports with the F1 and Moto GP races - and hopefully some still to come as the seasons come to an end. And even better World Super Bike racing, again with a couple of races left in the season and it couldn't be any closer. I may have missed some sports off this list, but these are the ones we at Strumble Head Amateur Radio Klub have been watching. It now comes into the winter sports and our other favourite sport Rugby - a gentlemanly game played with odd shaped balls. We also have the winter DXing and contesting season to look forward to on the radio, with the CQWW RTTY first at the end of September, then the SSB leg in October, and finally the CW in November. I am sure you will hear some of the members on the air, we may even get M9W or MW9W on if we get chance. But back to the end of the Paralympics and closing ceremony. Like the opening ceremony it was a full on spectacular event with Coldplay and Rhiana taking centre stage and giving 2 of the best concerts of their lives. Then on Monday 10th September most of the members of Team GB had a parade through London ending at Buckingham Palace and a special concert. I guess we here in the UK certainly know how to put on a show when we turn our minds to it. The best thing about the whole olympic game thing, in my opinion, is that virtually everyone has been behind Team GB, or as we have many foreign visitors and people living here behind their national team. I live in the Asian community and they have been fantastic fun, cheering for Team GB when they have not had any entrants from their home country to cheer, having some banter with me about the games - but then I am also a cricket lover and when England play Pakistan or India the fun we have is superb. When we have not been watching the Olympics the whole Strumble team have been busy with other aspects of their lives and hobbies. Tim and Charles have been busy with their QSL work, especially as they share the burden of the 2 major dxpeditions of CY9M and 9M4SSL OQRS (Online QSL Request Service). I believe both lots of cards are almost ready for despatch and it is wise to keep an eye on Tims website for full details. Ant and Laura have been major busy with their shop (click here for great deals on printer ink) and Ant with his Antenna building work. Ant is also in the final stages of planning a trip to Lundy Island mid October with John (M5JON) and Peter (M0ILT), sadly I have had to pull out of this due to financial constraints. Rob has been busy down on the farm with the Harvesting of the crops. Again a full time job. Jane managed to get up to London for the Olympic Equestrian dressage event at the start of the games and hopefully we may get a update from them both shortly. Tony as usual is retired and is working even harder now than when he was in full time employment! He is also busy with the roll as Secretary for the CDXC group. Chris has been enjoying the Olympics and getting on the air with GO1VDP when he has finished his work, and as can be seen on here updating the blog as often as possible. Charles and Chris, and some of the other guys too, share a passion for aircraft, Chris is more the old military ones and Charles anything that gets airborne. Needless to say Chris had a trip to his homeland of Yorkshire and spent a afternoon watching the Avro Vulcan XH558 take off and land at Robin Hood Airport Doncaster - this used to be RAF Finnigley near Doncaster where there used to be some fantastic airshows. The Vulcan still brings up the hairs on the back of his neck when it is seen what an Awesome sight! That's about it for the group update. Heres to a good winter DXing season and lets hope that the sun is kind to us. Sadly we are coming to the end of the Paralympic games, and the Olympic games in London 2012. And to the end of what has been a memorable event here in the UK. It has shown that people from ordinary walks of life can achieve their goals and become winners at all levels. There have been tears of joy, of pain, and of failure. Smiles and laughter. And every other emotion that a human can show. Photographs in the media of a proud parent looking on as their child has just won a medal, photos of the atheletes - both able bodied and paralympians - crossing the finish line with the smiles of the winner and anguish of the loser, and one that as I have previously said will stand out for me of the british rower crossing the line and the sudden realisation of winning gold and saying to her partner "we just won the Olympics". But every competitor, in my book, is a winner for qualifying and taking part. Heroes all. There have been other moments to remember too. The video on you tube of the games maker being ironic and sarcastic, the disabled atheletes in the 100M using the special developed blades, the Equestrian events with the jumps being made to show London landmarks, our Queen entering the games by jumping out of a helicopter (a spoof we know but how funny), the opening cermonies with their themes and spectacular shows, and I guess the closing cermonies - although we haven't seen the closing of the Paralympic games yet - which were and will be just as spectacular and fun. On a radio point of view we have had fun for the past few weeks using our special prefixes, and it has been fun for me to have other hams email me asking if we can make a contact with them. It has been my pleasure on all occasions to oblige the requests and make the contacts. The special event Stations in London and Wales (2O12L and 2O12W respectively) have both been popular on the bands along with the special call aired by our good friends in Warrington GB2012MV. We hope you all had fun chasing these special calls, and especially the individual calls that all the UK radio amateurs had the chance to use if they applied for their Notice of Variation to their licence. So as a group we would like to send our thanks to all the atheletes, volunteers and organisers of the 2012 London Olympic and Paralympic games for the fun, the tears and the spectacular sporting endeavours over the past 6 weeks. We now look forward 4 years to Brazil in 2016 and hope that they have as a successful games as in the UK. As you know we are firm believers in the DX code of conduct, and our dream is that one day ALL operators will follow these guidelines. They are not rules, although I think they should be in some cases of bad operating, but common sense on how to work DX stations - be it a single operator on S79 (Maldives) or a major expedition on 3Y (Bouvet). This months (September 2012) Newsletter from the website has a very funny, but true, video courtesy of NZ3M. I for one did not know that Mr Spock off Star Trek was a DXer, but he is the guy in the video and I for one would not like to have the Vulcan death grip put on me!!! Just follow the link here to view the video, and click on the DX Code logo to read the latest news and to get to know the DX code of conduct. Here we go again, 10 days of sport over 20 different events with numerous sub events - Athletics covers such as the 100 Meters, 200 Meters, High Jump etc. Yes the 2012 Paralympic games have started, and what makes these even more special then the previous games is that every person competing has a disability of some kind. Whether it be like some of the runners where they have limbs amputated, in a wheel chair due to other injury and playing basketball, or like Ellie Simmonds having Dwarf Syndrome every one is classed disabled. These are the true heroes of sport as they train just as much as full able bodied atheletes, they are dedicated just as much as able bodied atheletes, but most - no all - of them have had to overcome some difficulty to get to where they are now. Once more the organisers of the London 2012 games put on a exceptional opening cermeony, this time starting with the "Big Bang" and celebrating the discoveries and inventions of science through the years. Steven Hawkins made a inspirational speech saying we need to look to the stars and set our goals high. There was the usual parade of countries, and the Olympic flame descended into the arena carried by a Royal Marine, who had lost his legs in a conflict, from the 100ft top of one of the buildings down a Zip Wire (a wire between 2 points with a harness or other device attached allowing the person to slide - also known as a death slide) and then handed over to one of the first Paralympian medal winners to light the cauldron. Fantastic. And once more I think Great Britten showed how we can put on a party and welcome the visitors and atheletes to the games. Don't forget that during this period we will still be on the air and using our special calls, MO0OXO and GO1VDP, on all modes. Sadly Charles has had a computer failure and has been off air for the past few weeks but he is getting back on this weekend and will be racking up the contacts. Also look out for Chris on JT65A on the HF bands. He has just got the software and his radio working so will be using this mode over the weekend to give people a chance of getting the GO1 prefix in their logs. And remember to support the atheletes now competing in the Paralympic Games, London 2012.